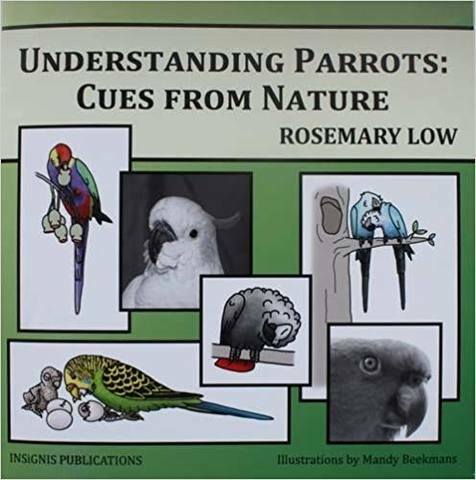 Rosemary Low provides rare insights into their world, gained from fifty plus years of intense daily observations of more than 200 species and of parrots in their natural habitats in 27 countries since 1974. Many people keep parrots in their homes, yet they know little about their wild relatives. "I want them to know", she says. "I want them to care what is happening to them." She reaches out to those privileged to interact with them on a daily basis, appealing for new standards of parrot care that recognise parrots are sentient and highly intelligent creatures whose psychological needs are too often neglected. In this book the author has woven together details of their lives in the wild and relates them to what they need in our homes and aviaries. It is a treasure-trove of parrot information, divided into seven sections: The Parts that make up the Whole, Psychology, Behaviour, What Parrots Need, Breeding, Foods, and a philosophical section entitled Stop and Think.... The text is beguilingly enhanced by the delightful, often quirky and humorous, colour illustrations of Mandy Beekmans, a talented Dutch artist. Last edited by Kruza; 7th December 2018 at 03:49 PM.